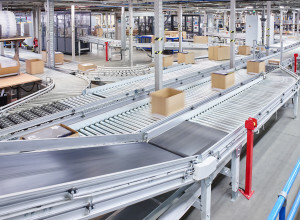 Axiom GB has installed an Automated packing and dispatch solution for Asda. 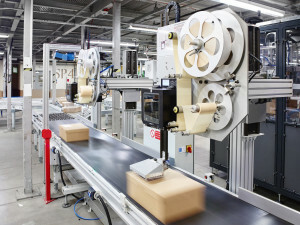 The system was installed in September and has now doubled throughput for Asda’s online orders for George.com homeware. Clipper Logistics are one of Asda’s key partners and are running the system at their Nottingham facility. The system uses 3 different size boxes, these are manually added to the conveyor, the boxes then travel to the picking areas. Pickers sign into the Manhattan warehouse management system which gives them a group of orders and the size of box required for each pick. Once the order has been picked, it is then weighed, labelled and scanned to see if everything is correct. 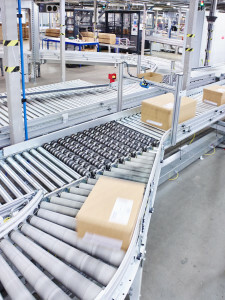 The automation system has a mixture of Swivel wheel sorters, belt conveyors and roller conveyors. then sorted into Asda’s eleven regional depots.